So gooey and so good for the people who make them: These brownies help workers escape poverty. Sink your teeth into these sinfully rich vegan brownies and let the flavors—cinnamon sugar, dark fudge—roll around on your tongue. Some might call them a "guilty pleasure," but there's no reason to feel bad about indulging once you learn the story of how they're made. Chew on this: Greyston Bakery, a fellow B Corp, hires workers who typically wouldn't be hired by most companies because of their past or present circumstances—no questions asked. And they don't just pay them a fair wage, they offer child care and workforce development, and have community gardens. Of course, none of this would work if people didn't crave Greyston's baked goods like crazy—which they (and we) do. (They baked our founder's wedding cake!). 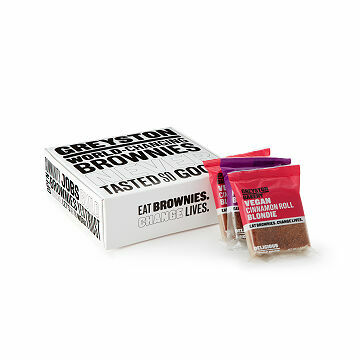 But don't just take our word for it: Ben & Jerry's (another fellow B Corp) uses only these brownies in their ice cream. Baked with love in Yonkers, New York. Founded by a Brooklyn-born Zen Master in 1982, Greyston Bakery has been making its customers and employees lives sweeter for over 30 years. A fellow B Corp, it has long been an influential leader of social enterprise. The organization’s spiritually rooted philosophy fuels community development and a commitment to human growth and potential, using entrepreneurship to address the issues of generational poverty in low-income communities. Their motto: “We don’t hire people to bake brownies, we bake brownies to hire people.” Its unique Open Hiring™ model embraces an individual’s potential regardless of background or work history. Providing a range of resources, including child care, community gardens, workforce development, and sustainability programs, helps support people as they transform their lives. We visited Greyston Bakery and spoke with two of their dazzling bakers, Cece and Raymond. Step inside and read their stories on our blog. I would buy this over and over and over and over again! Both flavors were great. Chocolate was my favorite but both were amazing. Not a lot of desserts that are dairy free that actually taste good. I still can't believe here isn't any milk or butter in these! So good! The blondies were a little gummy but they were still delicious and the chocolate brownies have been my fav for a long time..